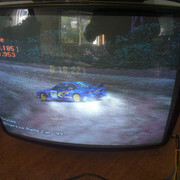 Hi i have got my hands on a 20" arcade chassis monitor. It's a WEI-YA M2820H, great picture very bright. What i have done its just hook red,green,blue,ground,sync signals from the chassis to scart plug. Tested several vintage computers and consoles the picture is great looking but i have a problem. When the whole screen is white bright having black text for example the image becomes very dark. If i up the brightness and brightness this will fix it but when i got to another screen that is not so bright i got retrace lines. Now i understand this problem my RGB video signals lack CLAMP so the black level it's not constant and float according to the signal strength. So someone know how to clamp the rgb lines ?. 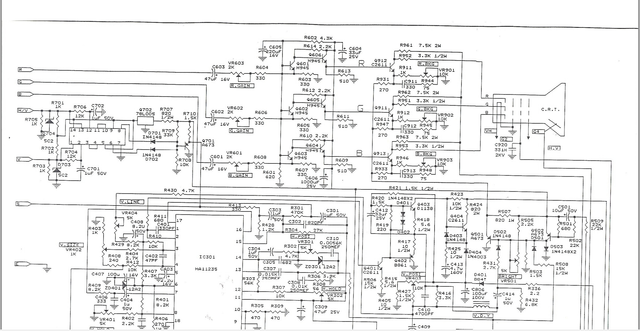 Ok know i have done my homework, need an example schematic on how to do this or maybe someone have experience doing so. What console are you running? 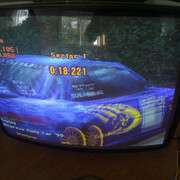 i have try PSX, PS2. Even if you gave the monitor direct coupled RGB video signals, your monitor would just ruin it anyway. 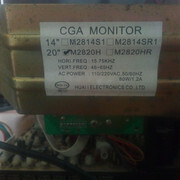 This monitor has a high pass filter on the input and no clamp (DC restore circuit) to fix it. Unless you want to modify the video amplifier section or replace the chassis altogether, this monitor will only work properly with games that have a constant average scene brightness. viletim dropping the knowledge bombs, as usual. Thanks for the information i was suspecting this, i could have no problem modifying the monitor board, the rgb color circuit don't look to complicated. Can you point me how this need to be modified ?, removing the caps and adding a diode to ground on each color line should be enough ?. 1. Check the chassis and make sure it matches your circuit diagram. 2. 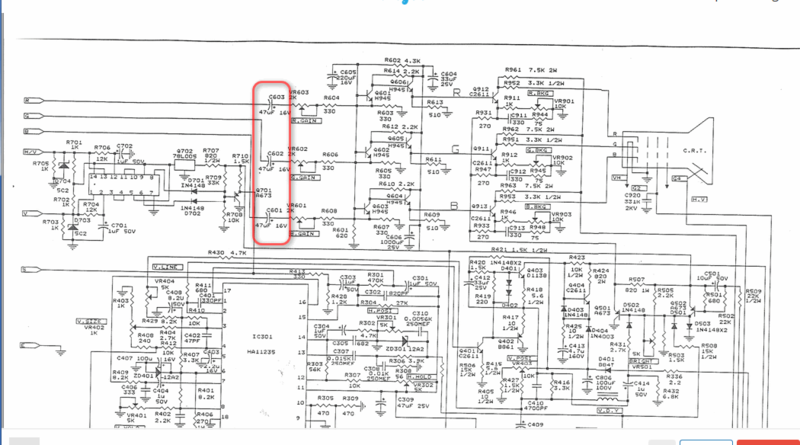 While the monitor is on with no video signal connected, measure the DC voltage on the positive leg on one of the video coupling caps (eg. C603) and write it down. 3. Jumper over the three video coupling caps C603, C602, C601. 4. 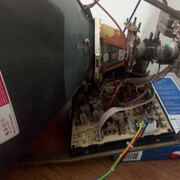 Connect a video signal to the monitor which has been DC restored and has an extra offset equal to the voltage you measured from the positive leg of the coupling cap. Nr 4 is the tricky one. If you have a device like the one in lettuce's post then just connect it and away you go. If not, you could try connecting your consoles using a modified RGB cable which doesn't have coupling capacitors. This only works if the console itself doesn't have coupling caps and the DC offset on the video signal is close to what your monitor wants. Sound like you need a video amp. Ultimarc sells them. Older CGA only arcade monitors were designed for arcade PCBs which put out a brighter (higher voltage) signal than consumer rgb hardware. Your typical arcade board puts out 2.5v - 5v. Consumer hardware puts out 0.7v. For brightness issues with consumer hardware, a video amp is usually the best thing to try first. 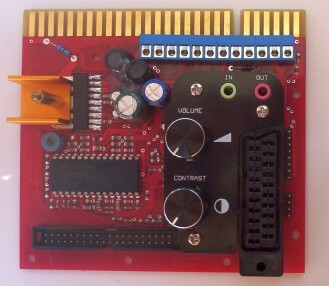 My Tri-sync arcade monitors have a switch for this to go between cga arcade boards and newer lower voltage vga games. If I set it for arcade boards, my PS2 would be too dim.